It started with the beautiful plant stand (below, far left) from Hook & Stem… We knew we wanted it but secretly we also knew that we needed a plant stand like a moose needs a hatrack. So it was destined for an alternative purpose. The pink wire basket (far right) was a Homesense find that smacked of the Ferm Living basket tables we longed to own but are way out of the price range. In the centre (above) are a perfect wooden circular platform and an embroidery hoop – both from Michael’s – that were morphed together to create a lid that fit snuggly into the rim of the wire basket. 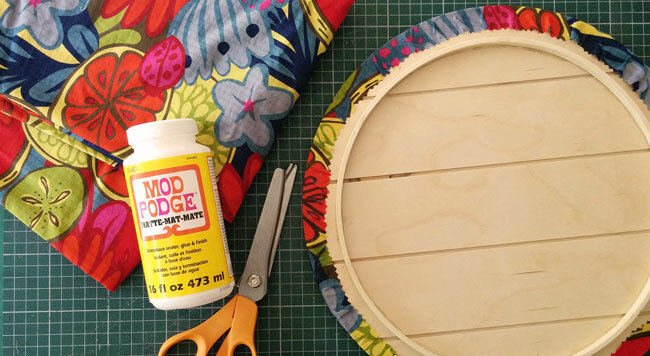 The embroidery hoop was trimmed to size and glued securely with Goop to keep the makeshift lid from sliding around. 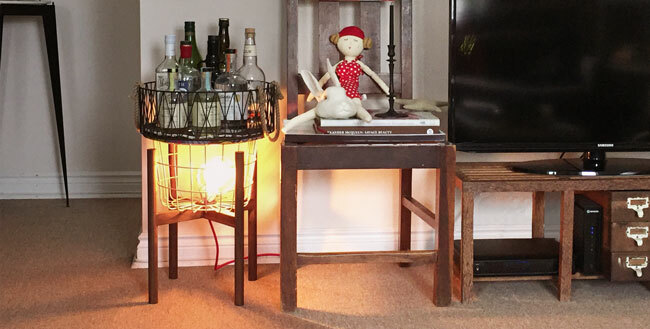 The legs of the plant stand, the cord set through the basket, the basket into the plant stand, the lid onto the basket and another wireframe basket that was holding our booze stash on the credenza, now sitting atop the whole thing. This entry was posted on Tuesday, March 14th, 2017 at 5:02 pm	and is filed under update&decorate. You can follow any responses to this entry through the RSS 2.0 feed. Both comments and pings are currently closed.